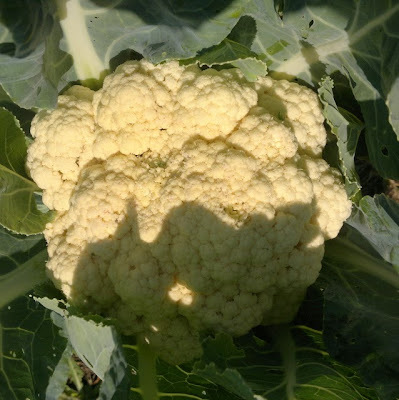 I've never managed to grow a cauliflower successfully here - the heat and inconsistent rainfall in the summer just isn't ideal for these fussy vegetables. I threw several away this summer which came to nothing, but the other day I noticed that there was still one left which had somehow developed as it should have done. Finally! The bean pods I featured two weeks ago have now dried up and the beans were, indeed, the Early Mohawk variety. I'm going to keep them to reseed next year, as there aren't enough to eat and to sow. Pretty, though, aren't they? The Cherokee Trail of Tears pole beans are much more prolific - I'm hoping there will be enough of those to eat as well as to keep for 2014. Although I do love eating fresh tomatoes, ever since we've been here, the focus of tomato-season for me has been turning the fruit into tomato sauce to last us through the winter. This was never an option when we lived in England and only had room for six or eight tomato plants - but now I usually grow about 100 plants, the scale of things is a little different! The season has really started now and I am picking ten pounds of tomatoes every three days or so. This is the perfect amount for making a two-quart batch of tomato sauce. Over the past five years I've tried different techniques for making sauce and I think this year I've finally found the perfect method for my particular crop. As you can see from the picture in the last post, I grow a lot of different types of tomatoes, many of which are pretty small. It's obviously not feasible to skin a cherry tomato, so my method works well for a big batch of different sized fruit. To avoid having your finished tomato sauce separate, you need to minimise the time between breaking the tomato up and getting the sauce boiling. This is because there is an enzyme in tomatoes (the snappily-named polygalacturonase) which will degrade the natural pectin in the tomato once it is exposed to the air and will turn the fruit and the resulting sauce runny. You want to get the tomatoes onto the heat pronto to stop the polygalacturonase breaking down the pectin. My method is to quickly process the fruit in batches of about two pounds at a time and to liquidise the tomatoes in a food processor before putting them through a food mill. If the tomatoes are large, I cut out any hard white parts and chop them into halves or quarters. With the smaller tomatoes, I just remove the stalks and put them whole into the food processor. The picture above shows what was left after I'd done that to ten pounds of tomatoes: not a lot, really. After 20 seconds of processing, the tomatoes are a runny sauce, which I then put straight through the food mill set over a large pan which is already on a medium heat. It only takes another 20 seconds to pass the liquidised tomatoes through the mill, which takes out the skin and most of the seeds. My mill is just the right size to hold the two-pound batch of sauce. This picture shows the leftover seeds and skin, which go into the compost bin. Big tomatoes have a lot more flesh in proportion to the seeds than small ones. Once the first batch of sauce is bubbling away, you can trim, process and mill the next two pounds, and so on, until you've done five batches and the pan is nearly full. I estimate this ten pounds took about twenty minutes to get to this point (well, not counting the picking part. Or the seeding/planting/growing/staking parts...). The next stage is easy - you just leave the pan on a medium heat for about two hours, or until the sauce is at the consistency you want. I cook mine until it's about half the original volume. And it's always a good idea to set a kitchen timer, because it's easy to forget about it. I give mine a stir about every half-hour. Up until this year, I always froze the batches of sauce in medium-sized freezer bags. 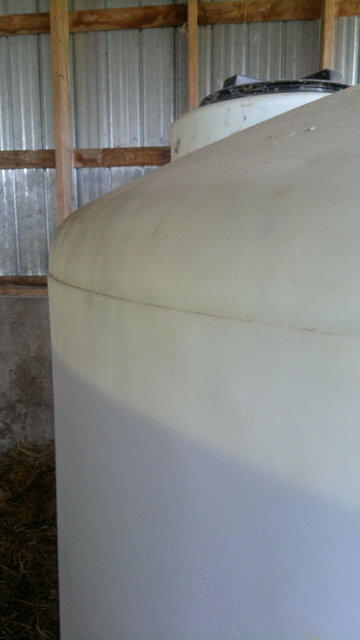 But with an investment a few months ago in a pressure canner, I now use that to further process it. I add a little lemon juice to the jars to make sure that the sauce is acidic enough to be canned. It takes 20 minutes at high pressure to make the jars safe to store in a cool, dark place. I suppose it does seem like a lot of work for something that you can buy pretty cheaply from a supermarket. But the thing is, I enjoy doing it - and there is a unique, hard-to-describe pleasure in darkest midwinter to be cooking a meal made from tomatoes that I preserved the previous summer. I know these fruit are free from chemicals and as local, ripe and fresh as it is possible for tomatoes to be. We got some much-appreciated rain this morning: about four hours of what I think of as 'Manchester rain', which was just what we needed to refill the barn water tanks and revive the parched-looking garden. I'd sown some more carrots, beets and lettuce at the weekend, so the soaking will get them germinating, with any luck. Despite the dry spell, the beans are coming along well - I think this variety is 'Early Mohawk', but I won't know for sure until I shell them, as I've only seen pictures of the bean seeds, not the pods (and I didn't keep the seeds separate when I sowed them with the other bush varieties). 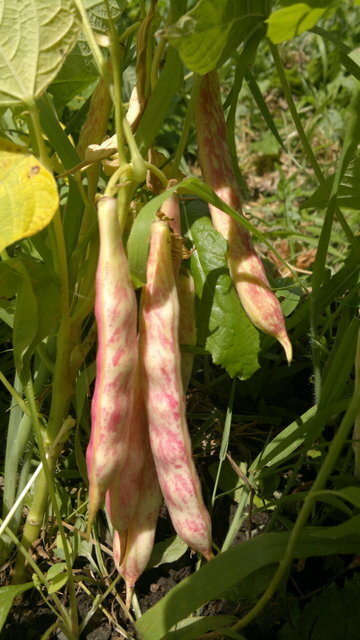 Very attractive-looking, anyway, and certainly early, compared to all the other dry beans I'm growing this year. The tomatoes are coming thick and fast, too. I've got my first batch of tomato sauce bubbling away as I write. It smells delicious! This is the first time I will have used my new pressure canner to make tomato sauce, so this is a preliminary test-run with a small batch (about four pounds of tomatoes). The canner holds four two-pint jars, which I estimate would take 20 pounds of tomatoes to fill, once they've been reduced down.